Simple, cute, and spring-like, today’s Poppet’s outfit was largely inspired by what I see actual children wearing. I wanted simplicity and sweetness which are not traits I generally associate with my work. I tend towards the more complicated. 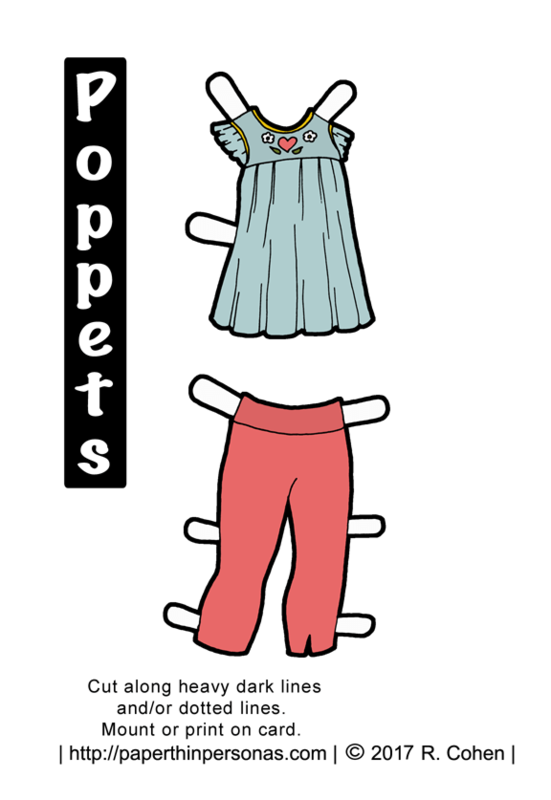 Also, I’ve done a lot of Poppets series paper doll clothing lately. I can always return to the Fairy Tales and Nursery Rythmes series and the 1920s Children’s Wardrobe Collection another day. Today is for something sweet and cute. It’s hard to get cuter than ruffles and a heart, after all. Originally, I had some plays for a more grey and yellow color scheme. Truth be told however, I really found that I liked the absurd sweetness of the pink and sea glass blue. For some reason, this whole outfit just feels like spring to me. I’m not craving spring. It’s autumn and I love autumn, but this outfit doesn’t feel autumnal.